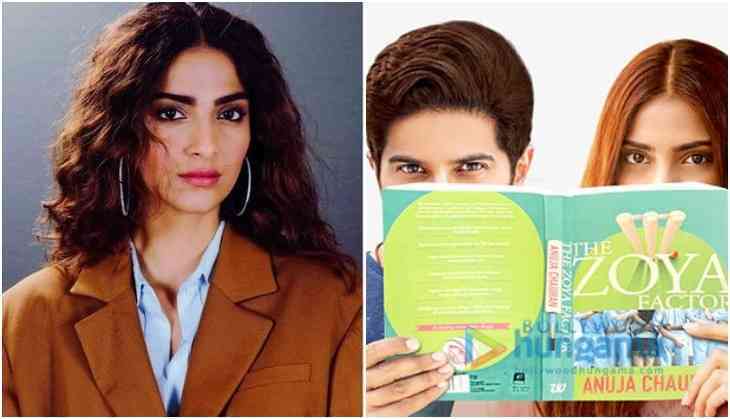 It is known that Bollywood actress Sonam Kapoor and Malayalam star Dulquer Salmaan will be sharing the screen together for their next Bollywood outing 'The Zoya Factor'. The shooting of the film has already begun and Bollywood actress Sonam Kapoor Ahuja has gone for a makeover for her character. Recently, Veere Di Wedding actress Sonam Kapoor attended an event and in this event, we spotted Sonam sporting the curly hair locks which is being said as her final look in 'The Zoya Factor'. However, she was seen in a pant-suit paired with hoop earrings and high heels. Sharing one picture of Sonam Kapoor on Instagram, her husband Anand Ahuja asked his sister-in-law for borrowing the suit that Sonam has worn in the picture. Now the whole family of Anil Kapoor can be seen commenting on this picture. As of it popular that Sonam Kapoor is playing a manager of Indian cricket team in The Zoya Factor, in which Dulquer Salmaan is playing Indian skipper in the film.